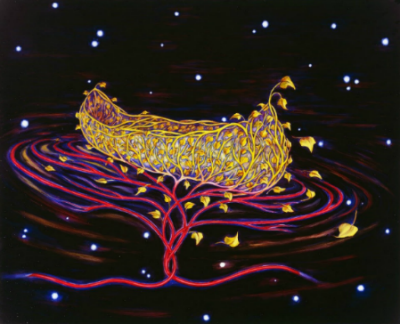 The canoe, encased in golden vines, floats in darkness, illuminated by stars, anchored by vein-like roots. Is the canoe waiting to take you on a journey through the unknown? Through memories? Will it navigate a passage that is comforting but just a little scary? Why is the canoe empty? Are you willing to get in? Born in Canada, transplanted to the San Fernando Valley at the age of 13, Margaret’s work reflects imagery from nature combined with a dream-like atmosphere, creating a compelling narrative that speaks of dislocation and invites the viewer to join in a journey of personal discovery. Symbols are at once intensely personal and universal. Her work has evolved over the years, yet is always concerned with psychological and emotional realities. Margaret earned her BFA at CalArts and MA in Art Therapy at Loyola Marymount University. Says Margaret: A fascination with my own and other artists’ approach to technique, materials, imagery and content led me to study art therapy. Having the opportunity to work with people through art has been a rewarding gift.” Her work is both widely collected and exhibited. Nielsen’s documentation was sponsored by Joyce & Ted Lombard. The AfterGlow was hosted by Karen Hoffberg.